In Tents Events has a multitude of staging options for events of any size or purpose. 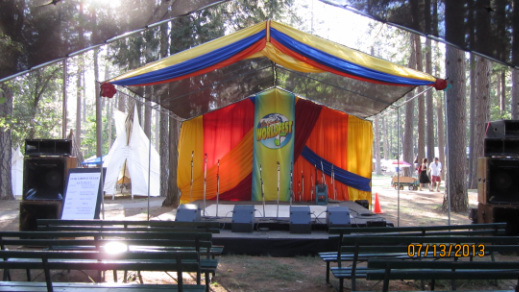 Our modular staging solutions can be configured to accommodate any type of music, fashion, or theatrical performance, whether indoor or outdoor. Our stages are built to your specifications from 4 x 4 panels for surfaces up to 40 x 24, from 8 inches to 4 feet in height, on flat or irregular surfaces. We can provide canopy covers, warm-up areas, and backstage enclosed areas, according to your requirements. Additional available accessories include drum risers, steps, skirting, draping, evaporative coolers, heaters, lights and misters. Our all-weather stages are made of the highest quality steel and other structural materials and are regularly inspected and maintained to ensure the highest level of safety, security and aesthetic presence. Our stages are compatible to any professional lighting and music production equipment. In our more than 20 years of professional stage design and construction experience, we have provided performance platforms for some of the largest music festivals in Northern California, and for some of the biggest acts in the business including Nitty Gritty Dirt Band, Ani DiFranco, and Little Feat. Call us today to arrange optimal staging for your next performance event.